Welcome to Best Western Heritage Inn! The amazing Napa Valley Wineries are the reason many guests stay at our Vacaville hotel, but there are many other sights to be seen, too. Our location, right off the freeway, makes commutes easy. Shoppers delight at the bargains found at Vacaville Premium Outlets , the perfect place to find an outfit for a day of wine tastings and vineyard hopping. With the Travis Air Force Base also nearby, our property specializes in hosting service men and women along with their families. Whether you are here for the pinot or to take care of business at the California State Prison Solano, you deserve a welcoming place to call home. You will be close to dining and the outlets at our Vacaville hotel, and our friendly staff members are happy to offer up tips and recommendations on places to go. Enjoy a great staff and amenities, both of which have received a lot of praise over the years. Free Wi-Fi, breakfast, a microwave and fridge in every room as well as double sinks in the bathrooms provide touches of home. Kick back and relax with a 32-inch flat screen TV or rent a bike for a view of the vines like no other. Our rates also make us stand out. Our property is not just for leisure travelers; construction companies and corporate clients depend on us because we blend quality with affordability. The location of our property, right in the middle between Sacramento and San Francisco, makes us popular for road trippers and those who have business in both cities. From dog shows to the downtown festivals, there's something for everyone who stays here. Visit the Sonoma Races or take a tour of the Jelly Belly Factory. Six Flags Discovery Kingdom and Fairfield's Budweiser are also an easy day trip. Check out one of the many sports team tournaments or explore the bicycle trails. Even business travelers can make time for a little leisure. Book Best Western Heritage Inn today. From: Interstate 80. 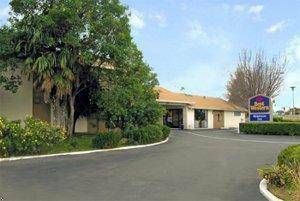 Take Monte Viste Avenue Exit to the Best Western Heritage Inn. We are located near downtown Vacaville.